Find out why this fast-growing midstream MLP deserves to be on your radar and could be just the ticket for boosting your portfolio's total return in a world of low energy prices. Oil prices are down 55% since their peak in June 2014, and not surprisingly, most MLPs have been taken a severe beating as a result. Yet not only has Valero Energy Partners (NYSE:VLP) managed to avoid getting gored during this crude collapse, it's also managed to post a sizable total return that has more than tripled the general market's. 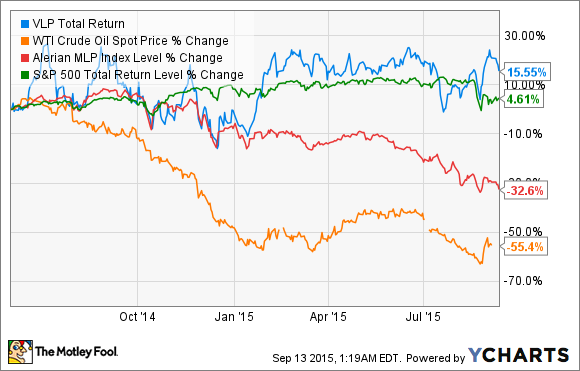 Why is this MLP proving impervious to both the oil bust and the recent market correction? Well, it turns out there are three reasons why Valero Energy Partners is one of the hottest dividend growth stocks in America today and, more importantly, why its growth story is just getting started and it deserves be on your dividend-stock radar. Valero Energy Corp. (NYSE:VLO) is the world's largest independent refiner, with 15 refineries totaling 2.9 million barrels per day of capacity. It's also Valero Energy Partners' sponsor and owns 71% of its limited and subordinated units, a 2% general partner stake, and 100% of its incentive distribution rights. Thanks to the oil crash and its lower input prices, Valero's business is doing great these days, with its last quarter's refining margin per barrel and earnings per share up 39% and 118% year over year, respectively. Valero Energy Corp.'s booming business gives it plenty of incentive to keep growing its assets, including $1.15 billion in new logistics infrastructure that the company plans to invest in during 2015 and 2016. Those assets, in turn, are likely to mean continued strong growth for its MLP in the years to come. What is so attractive about the midstream business model is its focus on long-term fixed-fee contracted revenue, which helps to generate strong, predictable cash flows that are mostly immune from energy-price volatility. Valero Energy Partners is a perfect example, with 100% of its sales derived from fees, and protected by 10-year contracts with optional five-year extensions with Valero Energy Corp.'s subsidiaries. Better yet, these contracts all have 85% of sales guaranteed by minimum-volume-contract clauses. In other words, Valero Energy Corp. is taking its existing logistics infrastructure and "dropping down," or selling it, to its MLP to grow Valero Energy Partners' distributable-cash-flow asset base. Already in 2015, Valero Energy Corp. has dropped down its Houston and St. Charles terminal service business to its MLP for $671 million, as part of its planned $1 billion in drop-downs for this year. This one transaction alone is expected to grow the MLP's annual EBITDA by $75 million, an 86% increase over 2014's full year EBITDA. And this growth story is just getting started, because its sponsor, thanks to its enormous scale and vast and expanding logistics base, has tons of assets with which to grow its MLP's cash flows. Source: Valero Energy Partner investor presentation. Income investors care mostly about two things: distribution growth and the security of the payout. Valero Energy Partners has both things in spades. For example, management is guiding for 25% distribution growth through 2017 and believes it can continue achieving some of the fastest payout growth in its industry -- on the order of 20% to 25% compound annual growth -- for several years after that. However, perhaps more importantly in a world of low oil prices, is that Valero Energy Partners' DCF is growing far faster than its payout. In fact, in its latest quarter the MLP's DCF nearly tripled compared with the second quarter of 2014, while its distribution grew by "only" 31%. That means the distribution coverage ratio, or DCR, this quarter was a rock-solid 2.17, almost double last year's Q2 DCR -- a still very impressive and secure 1.2. Valero Energy Partners isn't cheap, but compared with other rapidly growing midstream MLPs, it's not excessively expensive, either; especially when you consider its competitive advantages. Given the stock's current yield of 2.4% compared with the S&P 500's 2.1%, stupendous payout growth potential, and bank vault-like distribution security, I think Wall Street's love affair with Valero Energy Partners is well warranted. In fact, this MLP's exceptional long-term growth potential is so impressive that I'm adding it to my watch list, and I urge all income investors to consider doing at least the same, if not outright opening a position at today's reasonable unit price.